Each October, Todos Santos celebrates its foundation with a fiesta in honor of its patron saint, Nuestra Señora del Pilar (Our Lady of Pilar). The week-long festival is eagerly awaited, not only by the residents of this charming Pueblo Magico, but visitors from the world, who flock to the seaside paradise for traditional activities that range from folk dances and outdoor musical performances to sporting events, horse races, art exhibits, carnival rides, and delicious offerings from local restaurants. Highlights of the festival also include the yearly cabalgata, or procession of horsemen. Luckily, there’s still time to plan a trip for the 2013 Todos Santos Patron Saint Fiesta. For information about the best local accommodations, visit www.CalyCanto.com. 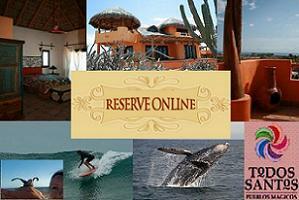 We look forward to drinking, dancing, and dining with you in Todos Santos!